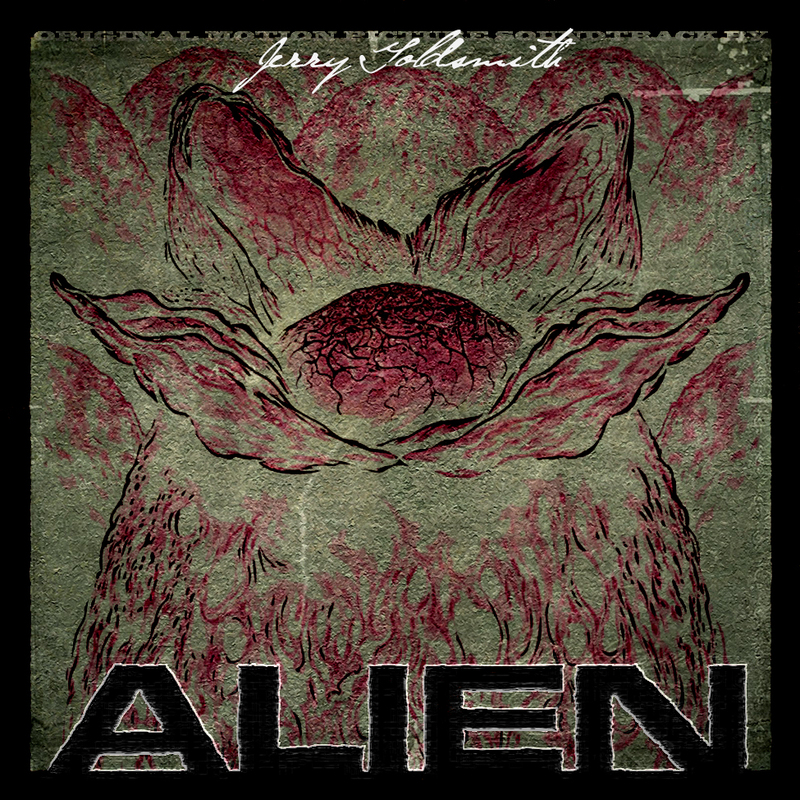 Faithful followers of my blog might remember an already existing entry to Jerry Goldsmith’s Alien. Indeed, I’ve already published custom covers to this soundtrack as one of the very first posts on HQCovers. But I always wanted to revise them some day and finally this day has come. Actually I’d like to take this opportunity to overhaul the whole Alien saga. But first things first, here’s one of the true classics in Sci-Fi cinema and film music history: Alien. H.R. Giger’s space creature serves both as source of many nightmares, as well as an inspiration to many, incredibly creative works of free-lance artists. Much like the film itself, almost all promotional material had very simplistic design. It rather encourages your imagination than showing you everything. The iconic image of the alien egg was enough to grab your attention. There was no need for unnecessary nonsense. An artistic direction which I tried to pursue during this series. 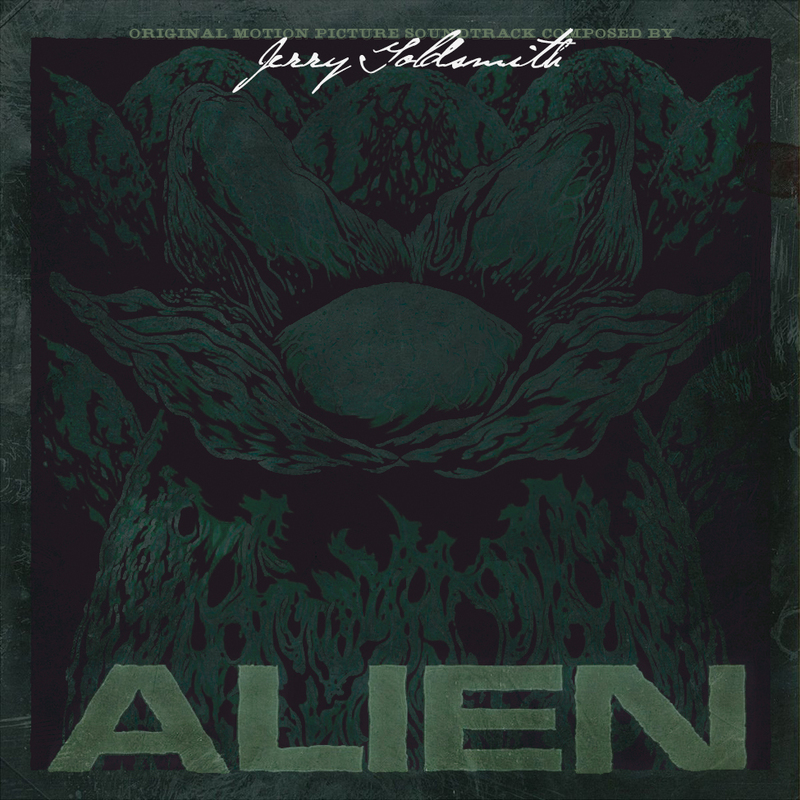 The first two covers are truly genuine remakes of Jerry Goldsmith’s original soundtrack album, specifically one of the 1979 Vinyl release by 20th Century Records (#1) and one of the CD published by Silva Screen in 1988 (#2). I pieced them together based on single graphical elements taken from various sources. All the text was recreated with matching fonts (Helvetica Neue LT Pro, Arial, Futura Md BT) and altered to look like vintage. I had real troubles adjusting the colour and contrast levels with these two ladies. After multiple tests on various screens and devices I finally settled on the settings you see above. It’s really hard to work with material of that age. There are so many potential sources of error that must be avoided, starting from the initial scan (both the device used and the scanning process) over the chosen graphics program (PaintShop Pro renders differentially than Photoshop) up to the appropiate file format. Nonetheless I badly wanted to remake these covers to obtain them in their full beauty. And they’re damn good looking if you ask me (even despite the incorrect egg… it was in fact printed in mirrored orientation on both releases!). In 2007 Intrada released a superb Complete Edition of the score with updated artworks (#3) and extensive liner notes (go to the bottom of this post for more). Despite these great original designs, I always wanted to create some custom artworks. Source material was available plentiful. You wouldn’t believe what extraordinary works the internet banks, once you start digging beneath the surface. In my first atempt (#4), I tried to keep in touch with the originals and just rearrange the elements a bit. I added the bottom layer of alien eggs to get a little more atmosphere and flipped the egg to the correct orientation as it was intended on the movie poster. Following that are a few designs based on different DVD and Blu-Ray releases (#5, #6, #7), where especially the third one proved to be challenging. I had to combine two different font types (InfraRed and VAST Naked) and different lightning effects until the album credits matched the style of the Alien logo. The last custom cover in this block (#8) is based on the one-sheet poster for the film’s 15th Anniversary, created by the late John Alvin. I like how he drew the Alien somewhat distorted and misshaped. Together with the orange glowing and blue smoke in the surrounding layers it gives the image a lot of tension. It’s also interesting that, while you get a notion of how the Alien kind of looks like, by shading it it still remains a mystery, just like in the movie as well. I’m finding real joy in recreating old Vinyl record covers lately, as you could probably see in my previous cover series for The Abyss or Nebraska. So during my effort to recreate the original Vinyl artworks, I also wanted to come up with all new variations as well. You can find the results below. For the first Vinyl custom cover (#9) I once again visited one of my favourite blogs, LP Cover Art, for inspiration. I really love composing these old looking vintage covers. Movie art media had a different vibe back then, one which you can hardly find anywhere nowadays. Please view in full screen for all the details. Vintage design #10 is based on the infamous “a word of warning…” one sheet teaser poster, designed by movie poster legend Bill Gold. I couldn’t resist creating this one, it was begging to be transformed into custom album art. I only changed to top tagline and added a retro vinyl record layer on top. Cover #11 was created from an original poster designed by Mondo artist Ken Taylor. During my Alien web-research (a leisure activity I can highly recommend!) I stumbled upon this motif several times, without any plan to craft something from it. But, as so often, it kept attracting me everytime I saw it. And so, primarily to get it off of my head, I started sketching out a few variations. In the end I almost couldn’t decide which one to put here. It’s basically a mish-mash of countless filters, effects and layers that turned out far better than I had expected. Custom cover #12 isn’t that custom after all, it’s actually based on a really strange, yet totally official Alien poster by Polish designer Jakub Erol. His design is freaky, surreal and even a little frightening. He basically captured the same feeling the Nostromo crew had during their first encounter with the eponymous space-monster. A brilliant approach if you ask me. So if you’re looking for a completely different artwork for your digital library, here’s your deal. Cover #14 adds Alien to my Limited Signature Edition series. I’ve come across a signature by H.R. Giger and suddenly realised that there was a real plethora of Gigeresque material I haven’t used at all. The rest came together pretty much by itself. The gallery below gives you a glimpse at the Mondo Vinyl Edition of Alien, with new original art from Stockholm-based illustrator Kilian Eng, who already designed Mondo’s Prometheus and Aliens. I really can’t wait to see his work for Alien³ – if Mondo decides to continue this amazing series! A little bit of side trivia: Just like his preceded work for Aliens, Kilian’s initial design contained a factual error. The front cover featured the warrior xeno from Aliens, whereas it should’ve been Big Chap from Alien. But don’t worry, Mondo already revised the official artwork, so everything’s fine. I’m finally also able to offer my completely redesigned Digital Booklet for download. I’ve been working on this thing for months and it sometimes drove me really crazy. I originally wanted to make all the text searchable, but somehow Photoshop couldn’t save the single pages without bloating the damn thing up to over 200 MB in size. So here it is in JPEG format converted to PDF. Twentyseven pages full of insight information and neat little pictures, all wrapped up in an eye-pleasing design by yours truly. I also hope for a score release of Isolation. I’m really curious in the all new hi-def performance of Goldsmith’s classic score.